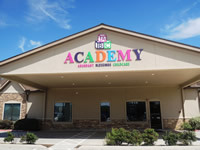 Welcome to ABC ACADEMY, LLC located in Montgomery, Texas, hereafter referred to on this site as ABC ACADEMY. VOTED #1 DAYCARE IN MONTGOMERY COUNTY! The goal of ABC ACADEMY is to provide quality affordable child care while securing a safe, HAPPY, healthy and developmentally appropriate environment for children. Our 11,100 square foot facility has been carefully planned and designed to provide a safe, secure, and stimulating environment. The center's flexible design allows for individual growth. It encompasses several learning centers to promote a homelike environment and a love for learning. Please explore our site to learn more about us. Thank you for visiting. 4-star Rating with Texas Rising Star! Texas Rising Star is a quality rating and improvement system for Texas early childhood programs. All center based and home based child care providers in Texas can apply to participate in TRS if they meet certain eligibility criteria. Programs that participate in TRS meet higher quality standards than many other child care programs. Visit “Texas Rising Star” to learn more. Question or comments regarding this web site? Contact us at webmaster@abcmontgomery.com. Copyright © 2007 ABC Academy Abundant Blessings Childcare. All rights reserved.